Valley Contax pledges to continue the development of refining its line of Custom Stable lenses and has done so this year by introducing two exciting new features – the Quadrant Specific option and the Edge Vault option. First, let’s look at the Quadrant Specific option. 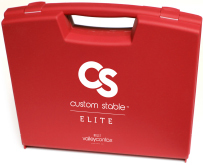 With this feature, fitters can further customize difficult cases where the bi-symmetrical toricity of the Custom Stable Elite does not suffice. The fitting of the Custom Stable with the Quadrant Specific option is surprisingly intuitive and clean. To your benefit, we’ve spent countless hours clinically researching the smoothest methods to communicate complicated fitting needs. 1. 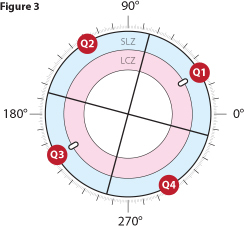 Locate and document the rotation of the flat landing zone marks “0”s (from the 0/180 corneal meridian). 2. Quadrants are labeled 1-4 in a CCW direction. The right side “0” is always quadrant #1. 3. 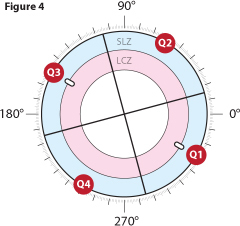 Both the LCZ and the SLZ are independently customizable in each of the 4 quadrants. 5. Custom Stable quadrant specific lenses will have a vertical hash mark and drill dot marker with ink that is designed for patients to insert at 270 (down) (see example). 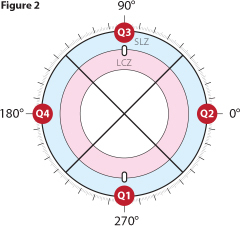 Here are some examples of Custom Stable Quadrant Specific lenses rotated, indicating the location of each quadrant respective to lens rotation. 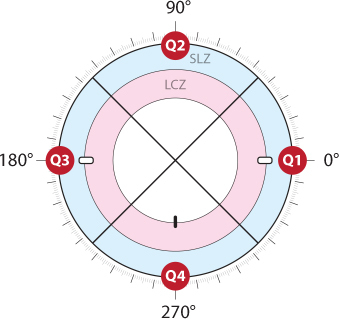 To customize the LCZ or SLZ, specify the quadrant and how many microns of clearance change is needed. The second exciting development in the Custom Stable line is our new Edge Vault option. 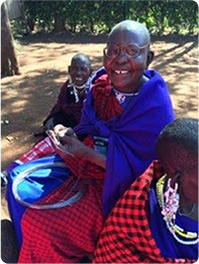 This lens option is designed to vault over extremely high sections of the cornea/limbus due to a pinguecula or any other form of elevation. Edge Vault is manufactured with state of the art precision lathes, and designed by sophisticated algorithms. 1. Rotation of the Flat meridian (laser “0”s) from the 0/180 meridian of the eye. Order our 12 lens Custom Stable Elite fitting set at the discounted price of $300 and we'll give you your first pair free! Plus if you're not completely satisfie, return the fitting set within 60 days for a full refund! Call, email or chat live via our website to take advantage of this amazing offer! and alumni from across the country competed for the first ever Custom Stable Cup. you to all who participated! 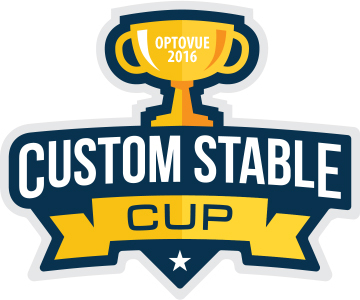 Want to hit the fast track to learning how to fit the Custom Stable™? Join us for one of our Custom Stable Friday sessions. This is a hands-on approach to learning everything you need to know about fitting, application and removal at our state-of-the-art facilities in Springfield, Oregon. Check our website or contact us for available dates and more info.